I promised in my earlier post on bomber defence, that I would go a little more into depth with the subject – which I’m doing now. See, I spend a couple of hours building an excel sheet to simulate different cases of bombers attacking ships. This gave some more detailed information I would like to share – but first a (rather long and mathematical) disclaimer. I simplified a couple of things. First, I used averages instead of binominal distributions – and averages can be misleading. An average damage of 1 could both represent 25 % chance of 0 damage, 50 % chance of 1 damage and 25 % of 2 damage but it could also represent a 90 % chance of 0 damage and 10 % chance of 10 damage. I would be rather calm about letting my soon-to-drop-troops-but-still-undamaged Seattle class take the first attack, but I would be rather worried about the second attack since there is a chance that the ship would be eradicated, never getting to drop. Now, in reality few distributions are so wildly different as in the above example, but it does give you an idea of the problem about using averages instead of using binominal distributions. However, the advantage is one of simplicity. If I used binomal distributions, I would always have to relate to odds which were never truly 0 % nor 100 % since we are using dice. This means that it is somewhat more difficult to set up guidelines. When are my ship safe from harm? Do a need 80 % chance of 0 damage or 95 %? With the averages, I regard something as “certain” if the odds are 50 % or greater. Another simplification is about how you spend your point defence. At a glance, how to use your point defence seems simple. Since 2 successes is needed to remove a critical hit instead of a normal hit, given the choice you should remove critical hits if your armour save is 3+ or better since the break-even is 4+. However, in reality, it is somewhat more complicated. Take the simple question – what to do at 4+ armour? Remove 2 normal hits or 1 critical hit? Looking at the averages, it seems that it is irrelevant if you do one or the other. But looking at it differently you see, that removing the critical is a gamble – the maximum potential damage increases but so does the minimum potential damage. If the total damage has little or no chance of inflicting a crippling damage roll (or destroying your ship), taking the gamble might be a good idea. But on the other side – if you only have 1 hull point left before you explode, you absolutely have to remove the critical(s) no matter how much more damages there is, as you have no chance of survival without it. All of this means, that spending point defence isn’t always a trivial decision but can potentially be a rather complicated one. So, since I did not want to build an artificial intelligence who can juggle different risk profiles (I was only using excel, after all) I went with a simple model; It takes 8 PD to counter a PHR bomber and 6 PD for any other. As for the averages vs. the binominal distributions this simplifies things and hence also makes it slightly incorrect – but good enough for our use. And in case you wonder where PD numbers come from, here is the math quickly presented; a PHR bomber averages 1 crit and 2/3 of a normal hit. On a PD dice you average 1/3 success – of which you need 2 to protect against a crit and 1 to protect against a normal hit. This means 6 PD to protect against the critical hit and 2 PD to protect against the normal hit. The other bombers all roll 2/3 of a critical hit instead of 1 which is 2 PD less, giving a total of 6 PD. I have made four simple overviews – one for each fleet – which give you information of when you should use three different options – manouver, Fine Debris Field and Dense Debris Field. For each ship denomination three numbers are given representing the number of bombers where a certain action will reduce the average damage. 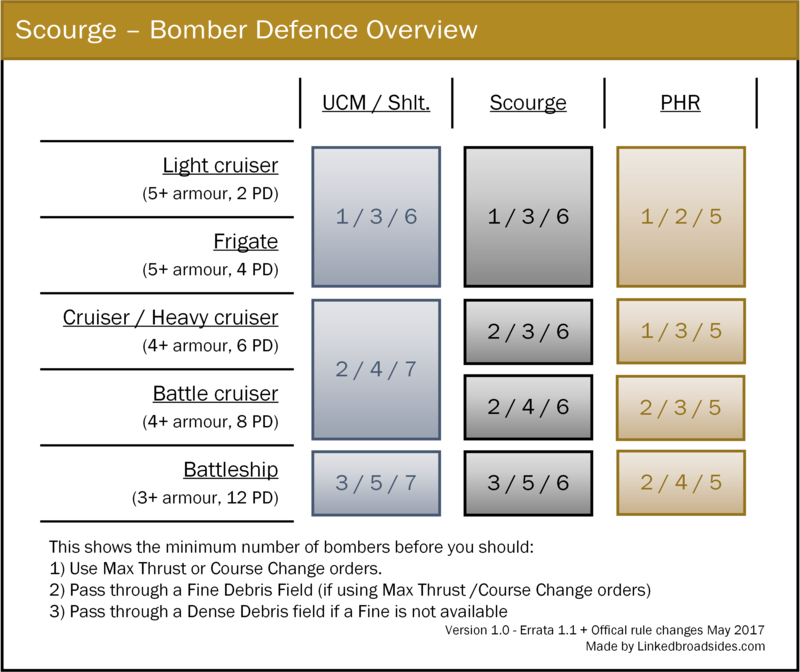 The first number tells you, at how many bombers you should use a manouver order (Max Thrust or Course Change). If you have a high enough PD, this number can be 2 or even 3 since you can (statistically) assume that you PD will eliminate the bombers totally. 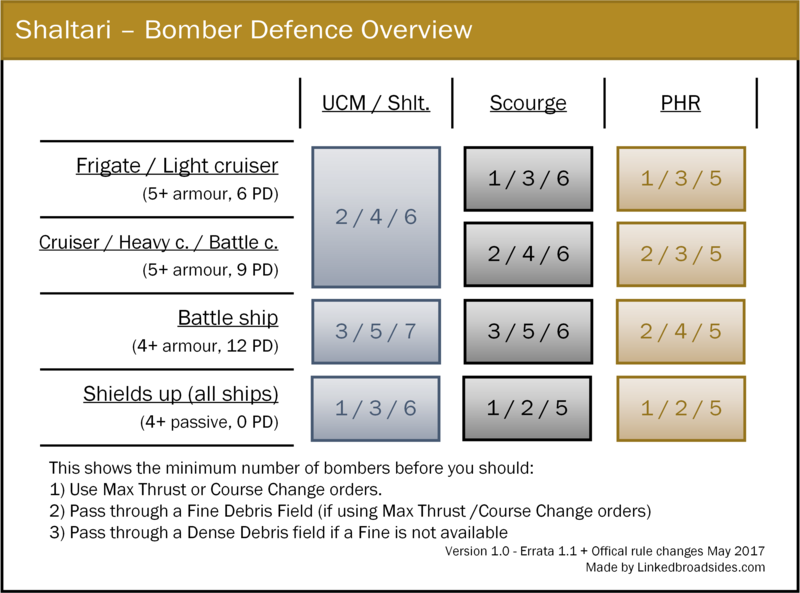 The second number tells you, that if you have the option of going through a Fine Debris Field and are already manouvering, at how many bombers will this on average give you a net damage reduction. If you are not already manouvering the number is lower (usually the same as the first number). Finally, the third number is the same as above but with the Dense Debris Field – here also assuming that no Fine Debris Field is available since that is preferable. In short, the information this sheet gives you is the bracket where you (somewhat safely) can choose not to manouver, when you have to start manouvering, when (assuming you are already manouvering) going through a Fine Debris Field is a good idea and – also assuming manouvering – when going through a Dense Debris Field could serve as a backup to the Fine Debris Field, if that is not available. And now – without further ado – the aforementioned sheets – let’s look at them divided by fleet. As for so many other things, this sheet is rather straightforward for UCM. They have – as you will see – pretty average numbers. We see here the advantage of cruiser PD on the light cruiser making it the only fleet where the light cruiser is (occasionally) better off than the frigates. Scourge have excellent PD and if you compare designations with UCM you will see that this better PD enables them to postpone the use of active defence a little longer. Against the PHR this is somewhat outweighed by the higher amount of criticals they can make and they fare only slightly better than the UCM. PHR have the worst PD in the game but this is outweighed by the best armour. Against their own bombers, they are actually worse off than UCM but other than that their defence profile is – unsurprising – identical. Shaltari is also in this situation a special case. Their very high PD combined with their low armour means that using a Debris Field – even af fine one – is relevant somewhat later than for the other fleets. The shields also bears special mention. Using them significantly lowers when active defense modes are relevant. This is both because a 4+ passive defence makes debris fields less threatening but also because a PD of 0 means that you have no “base defence” taking care of the first one-and-a-half bombers breaking through. 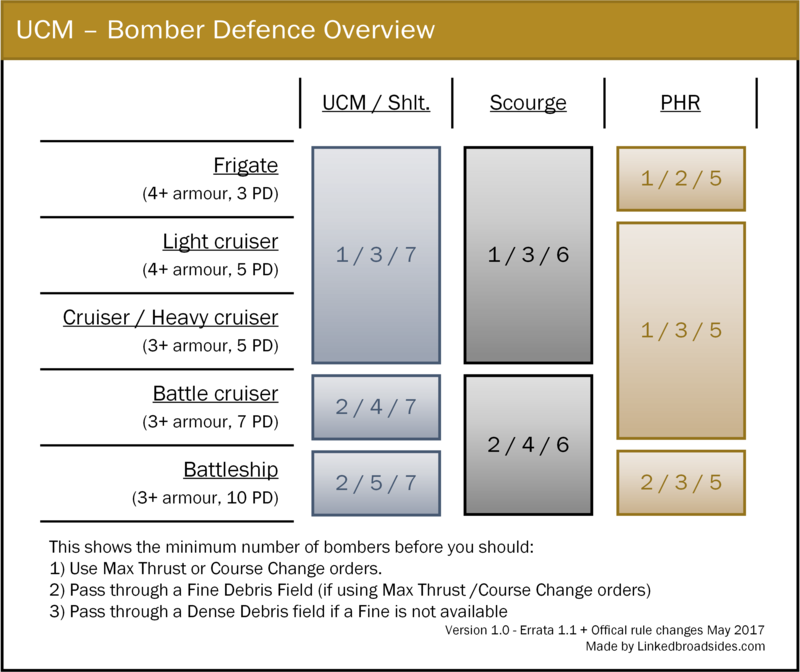 Also notice for the shield, that due to the “scald” rule also affecting shields, active defence against scourge bombers follow the same rules as for PHR bombers. While this is a curious analysis and potential decision support, this is not a tool you can use blindly. For instance, strategic reasons might mean that even though a Course Change would save you a lot of damage, you absolutely want that Weapons Free order so you accept the damage to be able to deal out more damage to a critical target. Remember, that the damage from a Debris Field comes before shooting and the bombers after. Another consideration is damage potential. Flying through a Fine Debris Field might on average reduce your damage but it does increase the overall potential by two. 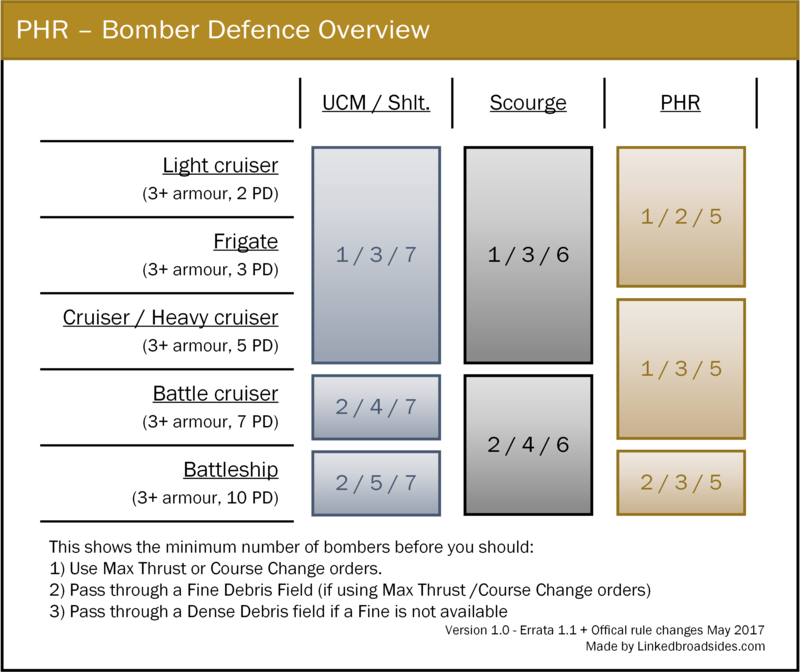 If you are hunted by two PHR bombers and have 5 hull left before destruction, maybe you’d be better off to accept the bombers damage because you know that can’t destroy your ship than to risk some extra damage for an average reduction. Finally, group or battle group formation is another factor. Maybe you’re out of group formation, so special orders are off the table. Or you will destroy group or battle group formation by passing through the available debris field? In an actual game it is – luckily! – rarely simple to make the right decision. Finally, you’d notice that I make no mention of corvettes (and the void gates). All atmospheric vessels are better off going to atmosphere for protection except for some very special circumstances. If they for some reason can’t or won’t go to atmosphere, their low hull and bad armour makes the rules simple – all but a Dense Debris Field is a no-brainer (and if you get to the point where the Dense Debris Field would reduce you average damage it is already so high, that you in all likelyhood is dead, no matter what you do). The full printable version of this tool can be found in the ressources page.